Keller may be the best BU player in some time. As I have said he reminds me of Drury so much. Was it he that made Bellows ? Could be. I agree. I think Bellows is cocky and lazy. His play has been mediocre at best and Im glad Quinn benched him. Let it be a wake up call that you’re not the special snowflake you think you are! 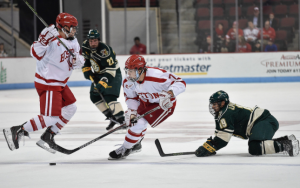 Bellows is a talented player who is having a tough adjustment to Division 1 hockey, which is somewhat surprising since last season with the NTDP U18s, he played numerous games against D1 teams (including BU). Early on, he was clearly pressing, breaking his stick on shots and not getting his shot on net. Hopefully he’ll adjust and have a better second half, as Carpenter did last year. Suggesting that Keller “made” him is simply wrong. Bellows has been a scorer at every level–before playing with Keller last year. Two seasons ago, he was the USHL Rookie of the Year and set a goal scoring record for a 16 year old with 33. Bellows does have a cannon of a shot. I agree about Keller. He could help us go far in March and April. Bellows needs to develop the other aspects of his game in order to be successful at the college level and beyond. Right now when he’s not scoring, he’s done more to hurt the team b/c his effort isn’t there when he doesn’t have the puck. It’s part of his development curve and I really hope he puts forth the commitment to improve in those other areas b/c he could be a pretty special player. kiefer will be fine he is a great kid with a great work ethic. He is working on his game he plays good positional hockey. He has taken a few too many penalties but that will be corrected don’t worry about kiefer he is a special kind of hockey player we are so lucky to have him. Go Bu? I was up in vermont this weekend for the games and happy with what I saw on Friday altho we lost remember it was 2-2 with 10 mins left and their goal was on a delayed penalty kill and loos puck it wasn’t our best game by far but we were right there and on Saturday probably one of our best efforts and it’s definitely because Keller is back he makes pp and pk that much better and for those who were and are worried about our “goalie” situation please knock it off this Jake kid is the real deal… Let’s not forget uvm was on a 8 game winning streak and playing some good hockey I guess what I’m trying to say is whem we lose I read some of the comments it’s unreal how negative they are ..I truly believe this team will be there in the end and with Keller back bellows with shine again.. Go bu.. I think many people are a little dissapointed how casually the team plays at times. For all the talent and top draft picks, too often they lack urgency and discipline. Perhaps this is to be expected with such a young team, but BC has more freshmen than BU. Hopefully, they have learned their lesson and will play the second half with the kind of focus, grit and determination that characterizes great teams.